Section 1.2 provides high-level feature differences for the ICH8 Family components. Note: Throughout this datasheet, the term “Desktop Only” refers to information that is for the 82801HB ICH8, 82801HR ICH8R, 82801HDH ICH8DH, and 82801HDO ICH8DO unless specifically noted otherwise. The term “Digital Home Only” refers to information that is for the 82801HDH ICH8DH, unless specifically noted otherwise. The term “Digital Office Only“ refers to information that is for the 82801HDO ICH8DO, unless specifically noted otherwise. The term “Mobile Only” refers to information that is for both the 82801HBM ICH8M and 82801HEM ICH8M-E, unless noted otherwise. This datasheet is intended for Original Equipment Manufacturers and BIOS vendors creating Intel® ICH8 family-based products. This manual assumes a working knowledge of the vocabulary and principles of PCI Express*, USB, IDE (Mobile Only), AHCI, SATA, Intel® High Definition Audio (Intel® HD Audio), SMBus, PCI, ACPI, and LPC. Although some details of these features are described within this manual, refer to the individual industry specifications listed in Table 1 for the complete details. 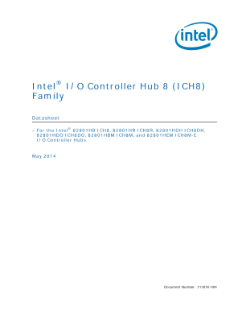 Read the full Intel® I/O Controller Hub 8 Family Datasheet. Learn how Intel® server products help partners build the most advanced data centers for innovative computing. Illustrates how higher performance cores provide significant advantages over lower performance cores. Discusses desktop virtualization compute models using the Intel® Core™ vPro™ processor family. Genevieve Bell, Corporate Sensing and Insights at Intel, talks about the future applications of artificial intelligence.